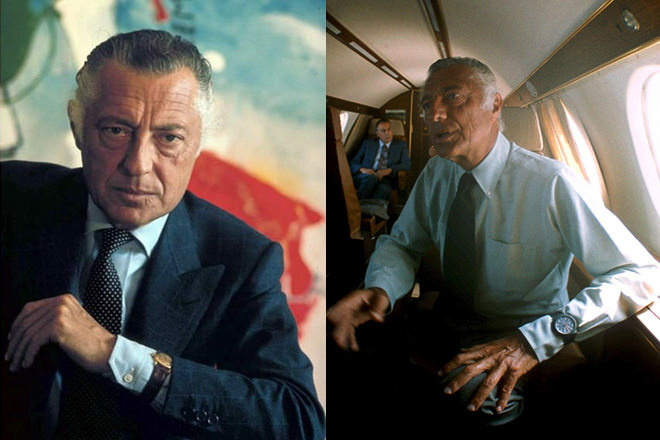 Gianni Agnelli, or “L’Avvocato” as he was nicknamed, was one of the most stylish Italian men who ever lived. A leader in his generation for wearing well-cut suits he headed the Fiat empire and was great-grandfather to another of our style favourites, Lapo Elkann. Agnelli’s style mightn’t seem revolutionary or groundbreaking today, but he indeed set the trends for much of the style we still wear now. When it came to his formal attire, he was a man of single-breasted suits in grey, wearing pale blue or white shirts with patterned ties in subdued colours. He was outfitted by Huntsman of London and Caraceni of Milan and Rome and always appeared buttoned up with his beautiful suits, but there was a certain irreverence about the way her wore them—almost a refined dishevelment. One example was his never-aligned neckties: Always askew and never worn through the loop on the reverse, his ties had a mind of their own and would flutter as he walked. The same could be said of his button-down collars worn on his days off. Always left undone they somehow worked tucked into jeans and worn with a cotton webbing belt. Casual was key and he would wear tie loafers and car shoes with suits. Most traditionalists would be horrified, but it worked for him. While on the footwear front, it was he who popularised hiking boots as casual wear. Timberland wouldn’t have the market they have now had it not been for Agnelli’s irreverence and hiking-boots-for-all seasons stance. But perhaps his most famous sartorial achievement wasn’t his wardrobe, but his signature accessory—a watch worn over his shirt cuffs. Whether an ostentation or a practicality it's something for which he was idiosyncratic and will be remembered. While it mightn’t have caught on as a universal style trend, he certainly left his mark. Vale, Agnelli.